Ever since he took over the director’s chair for Disney’s standalone Han Solo movie, Ron Howard’s been teasing fans of the Star Wars franchise with tiny glimpses from the set. (Like, “Here’s a picture of a bunch of water bottles” tiny.) 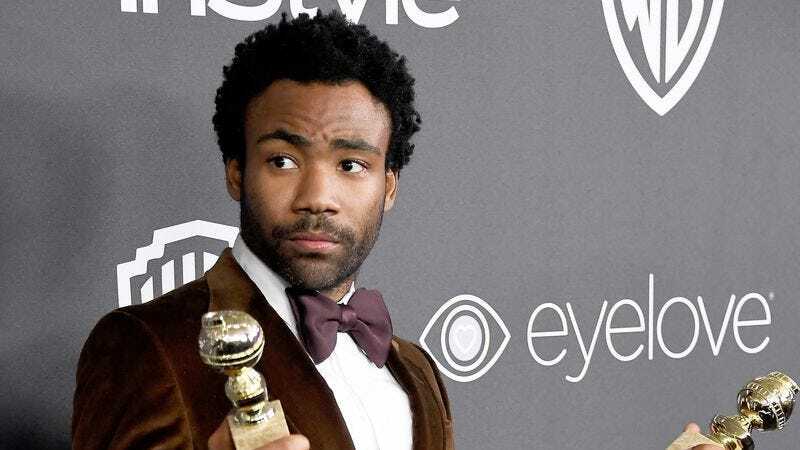 Howard’s finally starting to open up with a few actual looks at the film, though, offering up a picture of Chewbacca—who, admittedly, pretty much looks like Chewbacca—yesterday, and, today, giving fans their first little look at Donald Glover as Lando Calrissian. Of course, it’s hard to tell if Glover’s even fully in character here, or if he’s just hanging out in a kickass-looking jacket. Still, at some point this campaign of teasing has to give way to some actual info from the set, right? (Arrested Development narrator voice: “It didn’t.”) In any case, we have to hope that Howard and his team will at least give up the actual name of the movie at some point, at least so he can stop using awkward hashtags like #UntitledHanSoloMovie when he wants to describe his film.